Love that your 2 year old eats salad! Very cute and it looks mighty good. Yea for 2 year olds and their like of salads! I have often been frustrated by my now-fifteen year old's poor eating habits... we always have he good stuff here, torcherous trying to get him to eat enough of it. Still! I think the salad looks great! What fun lunch! Wow, that's impressive! No way my girl would have eaten salad of any kind at age 2 (she will eat some types now). I like the froggy gear! Kids and salad justn't doesn't seem to be a combination made in heaven! However well done to the twins for eating your salad even if Pierce just hasn't got the taste yet. I need to get some cute lunch stuff. Love the frogs. BTW, my two year old loves salad also, but his big brother (4) hates it! Really, my two year old will eat anything...crayons...sand. The only thing he fights us on is medicine! I have no idea how or why, but my every one of my kids (with teeth, that is!) would choose salad over ice cream any day. Not so much with green beans or brussel sprouts, but it's something, right? I love when kids will eat salad; Hunter will order that in a restaurant! Cute, cute ideas you come up with, Lisa! "caesar salad, homemade classic white bread, and beef stew." Great meal and with the kiddos asking for seconds, that is a definite A+ for you mom. Made me think of the Froggy series of childrens books. Homemade bread, salad, and stew? all for lunch? When can I come over? And a salad two year olds will eat??? I wanna have lunch at your house. We could just pretend I'm just one of the fellas there!!! 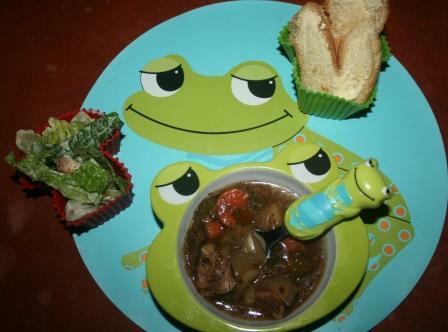 Looks like a great froggy lunch ---on a cold, winter day... That beef stew looks yummy... AND--I'm thrilled to see kids eating salad and veggies... So many don't!!! Ohhhh, what's your white bread recipe??? Love the toad stools and frogs. Your stew looks warm and yummy! I love that adorable plate and bowl! Glad to hear that your little one is eating his veggies. The salad looks awesome! I wish I could get H to eat salad! Maybe one day.. I think you would be such a fun mother. My kids both liked salad and I thought that was normal. It was other people that told me that it was rare, so I guess you're double lucky too! LOVE your new header, SUPER cute!!! Mmmm homemade stew YUMMY! Two of my lil ladies will eat salad the other one is hit & miss depending on what kind. My three year old just started eating salad. It was a total texture issue. That frog theme is so cute! Love it! My oldest wouldn't eat salad until she was a teen. I tried the ranch dressing, the ketchup, I tried everything and still she wouldn't eat salad until she was a teen. I am so jealous that your two year olds eat salad! None of my boys will touch a salad!! Well, Cole will if I drown it in ranch dressing. Bella is much more adventurous when it comes to trying new foods!